Good business continuity includes real-time data backup. On a recent Sunday night, I was home with my wife, watching a show, when a client texted me and said “Hey, I think our e-mail is down”. I checked my remote monitoring tools and sure enough, their in-house Exchange server was down. I was unable to reach the server remotely, so I drove to their building to check it out. Their e-mail server was powered up, but the fans were spinning at very high speed – not a good sign. I opened the server and found the heat sink lying in the bottom, along with the plastic hooks that hold the spring clips in place. The plastic part surrounding the processor is considered part of the motherboard and the server was out of warranty. It was clear that, no matter how we decided to deal with the physical failure, the server was NOT going to be working by Monday morning! 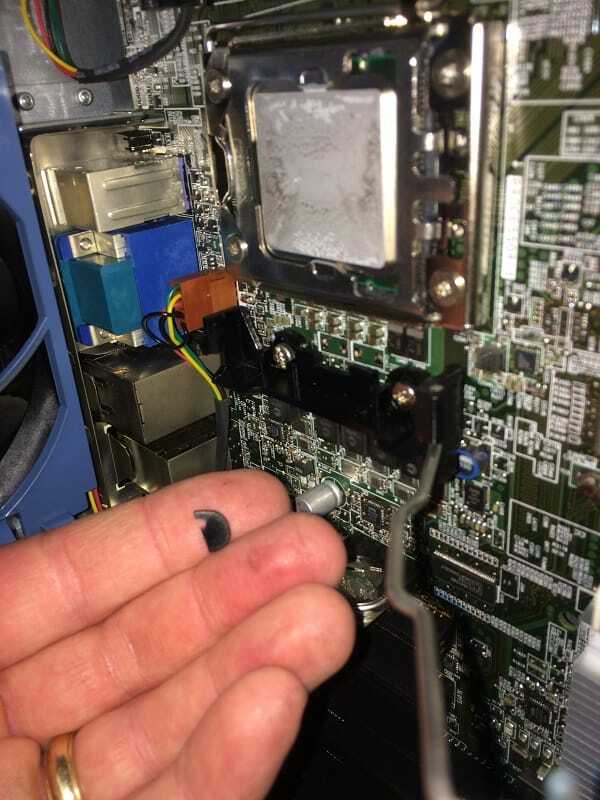 Broken heat sink clips on an HP ML350 Server. Good business continuity means not having to scramble for parts. I logged onto their Datto Siris unit, which backs up the server hourly. I clicked Restore, chose the Exchange server, and the latest backup. Then I chose “Local Virtualization”, which starts the backup on the actual Datto unit. I must admit, I did need to call Datto support to iron out a snafu, so it didn’t happen without SOME effort! Datto support, by the way, is stellar. The point here is that Monday morning, my client went about business as usual. Nobody knew the server was sitting on a table in pieces. This client’s previous tape-based data backup would have taken a day to restore, which is unacceptable. Worse, what would I have restored TO? I would have been driving to Chicago to get a replacement server before I could even begin the process. Since then, I have set my client up with a VMware system for superior business continuity. On a Sunday evening, I transferred the Exchange server from the Datto unit to the VMware system without loss of mail. Once again, on Monday morning, users were unaware that this had happened. Please Contact Us if you have any suggestions or questions about Business Continuity and Backups for your business.